Brezofil: Each tablet contains Doxofylline INN 400 mg.
Doxofylline, a new generation xanthine belonging to a new class of drug referred to as Novofylline, which is chemically 1,3-dimethyl-3,7-dihydro-purine-2,6-dione. Its molecular formula is C11H14N4O4 and its molecular weight is 266.253 g/mol. Doxofylline is a new creation long lasting oral methylxanthine extract. Methylxanthines are from the family of phosphodiesterase inhibitors. Correspondingly, its system of activity is associated to the reticence of phosphodiesterase action, initiating in bronchodilating actions. 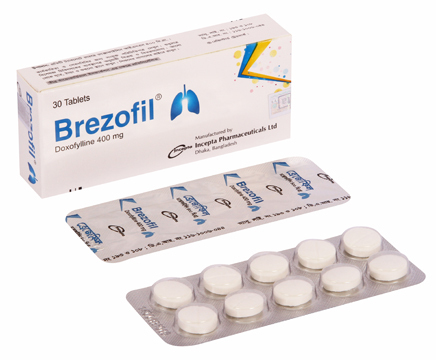 It has a bronchodilator effect which reduces rate of breathlessness in patients suffering from asthma. It helps relax the muscles in the bronchi and bronchioles, thus causing dilatation of the air passages and helping patients to breathe easily. The drug also possesses antitussive properties which help to control the cough linked with lung disorders. Doxofylline is mostly administered for maintenance treatment in subjects experiencing COPD (Chronic Obstructive Pulmonary Disease) and bronchial asthma. Doxofylline is not designed for use as an emergency treatment during an asthma attack. Adults: 1 to 3 times a day as the prescription of a physician. Dosage of Doxofylline depends on patient’s response to the medication. If a patient has been advised to dose once a day, he or she may be directed to do so in the evenings to reduce nocturnal symptoms. Elderly: The dosage may be decreased according to medical prescription in the very elderly patients with concomitant cardiovascular, hepatic, renal and gastric disease, to ½ tablet b.i.d/ t.i.d. After xanthine administration, nausea, vomiting, epigastric pain, cephalalgia, irritability, insomnia, tachycardia, extrasystole, tachypnea and occasionally, hyperglycemia and albuminuria, may occur. If a potential oral overdose is established, the patient may present with severe arrhythmias and seizure; these symptoms could be the first sign of an intoxication. Adverse reactions may cause the withdrawal from treatment; a lower dose rechallenge may start only after the advice of a physician. Use with caution in patients with hypoxemia, hyperthyroidism, liver disease, renal disease, in those with history of peptic ulcer and in elderly. Frequently, patients with Congestive Heart Failure (CHF) have markedly prolonged drug serum levels following discontinuation of Doxofylline. Animal reproduction studies indicate that Doxofylline does not cause fetal harm when administered to pregnant animals nor can affect reproduction capacity. However, since there is limited experience in human during pregnancy, xanthines should be given to a pregnant woman only if clearly needed.